Majorette contest (Southern California Majorette contest, El Prado Parkway, Torrance) sponsored by Torrance Area Youth Band, 1952. Supplementary material reads: "Chernus. Captions. Majorette Contest. One negative shows four-year-old Tommy Thompson, carrying his lunch pail and sweater admiringly looks at finalist Lana Routh, 6, of Long Beach, who shows her wares during Southern California Majorette contest at El Prado Parkway, Torrance. One neg. 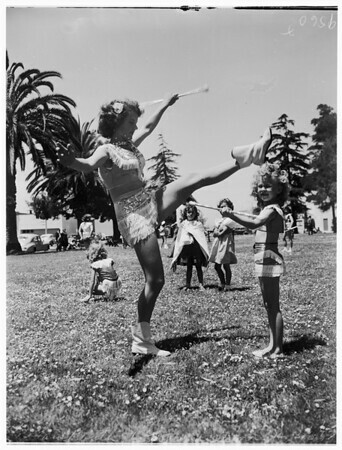 shows L - R: Lana Routh, 6, of Long Beach, the smallest contestant and Nancy Wiersma, 14, of Montebello, the largest, 5' 9 1/2" together. Both were finalists in the contest sponsored by Torrance Area Youth Band".